Is Rivet Revolution a charity? We like to think we are both – a social enterprise and a charity project. Legally, however, we are set up as an LLC, but we may change our corporate structure down the road. We donate 10% of every sale to charitable organizations focused on our mission of supporting caregivers, education and research. Which organizations benefit from Rivet Revolution's philanthropy? At this time we do not accept direct donations, so we encourage you to donate directly to the one of our rockstar partners. You can read all about them here! How do you reach the Rivet Revolution Team? Please email us at hello@rivetrevolution.com. We try really hard to answer our emails within 24 hours. We accept, VISA, MasterCard, American Express, JCB, Discover, and Diners Club, & Paypal. Can I send Revolution Bands as a gift? We love presents! You can provide a different mailing address from your billing address for any gift orders. Your Revolution Bands come packaged individually and you can add a comment to your order in the Order Notes field if your would like us to include a gift card! Bummer. We hate when that happens. Just email us at hello@rivetrevolution.com and we will sort it out for you asap. It will break our heart but you can return your purchase within 30 days. Simply email us at hello@rivetrevolution.com to receive return instructions. Who do I contact for press inquires? For all press inquiries please email liz@rivetrevolution.com and your email will be forwarded to our press team! What are the Coming Soon Designs? Occasionally we add new product listings up to 2 weeks before we have the products in stock. You can “pre-order” these items and we will ship your order as soon as the new product is in stock. If your order includes items currently in stock – we will ship those immediately and fulfill the remainder of your order when we have the new item. Hope this all makes sense! What size are the gemstone beads? This is an important question! Our Classic Revolution Bands are made with gemstone beads that are approximately 6mm or about the size of a pea. Our Kindred Spirit Bands vary in size: WAM and Part the Cloud Bands are made with gemstone beads that are approximately 8mm or about the size of a cranberry. HFC, 4MOM, and Forget Me Not Bands are all made with 6mm gemstone beads. Our Limited Editions vary in size – so please check the individual product descriptions for details. Are there any special care instructions for the Rivet Revolution jewelry? We want you to have your Revolution Band for years to come! To prolong the life of your Bands, please avoid exposing to detergents, chlorine, stretching, pulling or twisting. We recommend removing all of your Rivet Revolution designs before showering/swimming. Prolonged exposure to water can stretch the jewelry out unnecessarily. How are the Revolution Bands sized? S/M Revolution Bands fit up to a 6.5” wrist (usually fits teenagers and women) and the M/L Revolution Bands fit up to a 7.25” wrist (usually fits most men). Take a piece of string and wrap it around your wrist to measure. Every so often we like to run special promotions. Each promotion comes with a special CODE that you can find by subscribing to our newsletters and following us on social media and following our charity partners on social media. You enter our Promo Codes at checkout in the Promo Code field to win your prize! How does Buy 3 for $100 work? We believe the more the merrier! For every 3 Revolution Bands you will be charged $100 (a savings of $14). This includes a 10% donation to support our rick star charity partners. You can include different Bands (Classics, Limited Editions, Partner Bands) and/or different sizes. You can order multiple sets of 3 Revolution Bands – the shopping cart is “smart” and will automatically charge you $100 for every three bracelets you add. For instance if you want to buy 6 Revolution Bands (you will make our day!) simply add 6 bands to the shopping cart and it will update your price to $200! Can I exchange my Revolution Band for a different color or size? No problem. 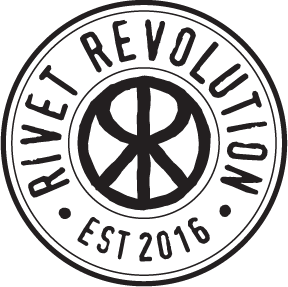 Shoot us an email at hello@rivetrevolution.com and we will exchange your Revolution Band. Where does Rivet Revolution make their jewelry? We purchase our gemstones from a US based importer; our charms are made in California; and all of our bracelets are assembled in the US. Are Revolution Bands intended for children? What can I do if my Jade beads become discolored? If your Jade beads become discolored from metal you can create a paste by simply mixing a small amount of toothpaste with a drop of water. Rub the beads and rinse with water. Voila! Are the gemstone colors consistent? Each bracelet is unique and subtle variations in color, texture and size of beads may occur and are what make your Revolution Band special. Carrier pigeon! No just kidding, USPS First Class. All Canadian orders are shipped via USPS & Canada Post. Large bulk and custom orders are shipped via UPS within he US and DHL outside the US. When will my Rivet Revolution order ship? We work fast! Orders are usually processed and shipped within 1 business day of purchase. When your order ships you will receive an email letting you know your order is on its way to you. If you have ordered an design that is “Coming Soon” we will fulfill that part of your order as soon as the new design arrives in our studio. We love shipping our designs all around the world. Revolution Bands ship free anywhere in the US. Orders outside of the US will be charged a small shipping surcharge depending on the shipping destination. Because of the costs associated with shipping internationally, all international orders are final sale. Many countries collect customs/duties for international purchases, so please review your country’s international customs policies as we are unaware and are not responsible for the payment of those duties and fees. Interested in fundraising for an Alzheimer's charity or event? Rivet Revolution can partner with you to support your fundraising efforts with a virtual “pop-up” shop. You choose 3 days to run your shop. We provide you with a pdf/jpeg to send, post and share with your friends and family. We track the orders received in your name on your shopping days and donate $10 from the sale of each bracelet to your charity! Super simple!! Interested? Contact us at hello@rivetrevolution.com. Live in the San Francisco Bay area & want to hold a Trunk Show? We are happy to support your fundraising efforts for Alzheimer’s charities and events with a Trunk Show. You plan the party and we will bring Rivet Revolution merchandise to you. $10 for the sale of every item will benefit the charity of your choice. Contact us at hello@rivetrevolution.com to learn more!